LA GRANGE — Some unwary birds flying over a local elementary school Thursday were in for quite a shock. 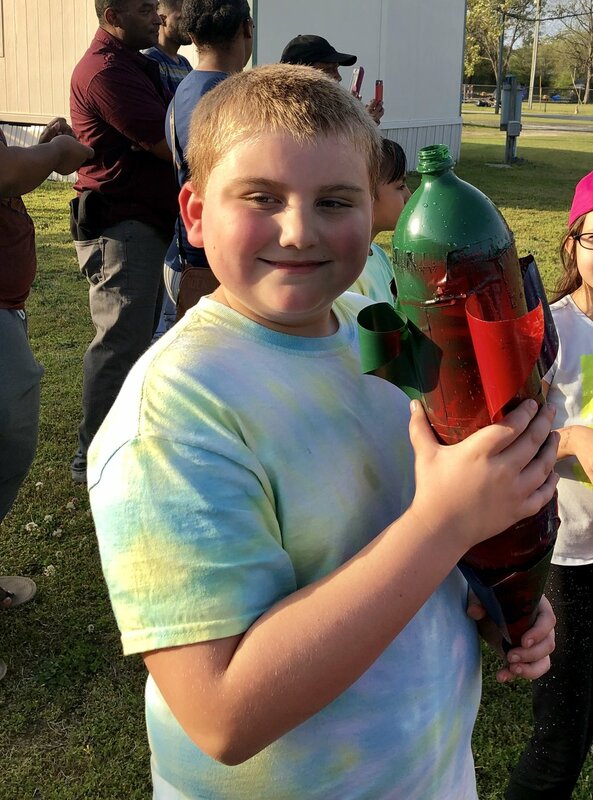 A bottle rocket competition, which sent the student-made rockets shooting hundreds of feet into the air, was the highlight of the Duke Energy Science Night held Thursday at La Grange Elementary School. Alicia Davis, a digital learning specialist at the school, spearheaded the organization of the event, which is part of the month-long North Carolina Science Festival and was made possible by a grant from the Duke Energy Foundation. Davis said she was thrilled that La Grange Elementary was able to hold the event, and she hopes they will be able to take part again next year. The school received all the materials needed to set up numerous interactive STEM (Science, Technology, Engineering and Mathematics) stations in the gym, the library and outside. Principal Lorene Bell said she was happy to see the number of families that came out for the event. “It looks like the parents are having as much fun as the kids,” she said. Dozens of parents and kids watched the bottle rocket competition. Davis said she was excited about how many students chose to make rockets to participate in the school’s first competition. Third-grader Easton Vinson said he spent about a day working on his rocket. “I tried to build the wings curly so it will be aerodynamic, and then I spray painted it,” he said. HIs rocket ended up coming in second, with a flight time of 8.12 seconds, behind the rocket built by Katora Johnson, which flew for 8.18 seconds and traveled across a parking lot and landed on the roof of the school. The event was part of La Grange Elementary’s overall focus on STEM education, and Bell said it is important for the kids to learn the why and how of everything.